This past week, Rob and I spent a day traveling down the Old King’s Highway (Rt. 6A Cape Cod), which is the largest historic district in America. The “old king” refers to whoever was king of England when the route was being settled by early colonists in the 1600’s. It was a beautiful day to drive through the villages along the way. Cape Cod is many miles long and I don’t often have a reason to travel down Cape from Falmouth, so it was fun to be a tourist for a day. We had a couple of places to go. 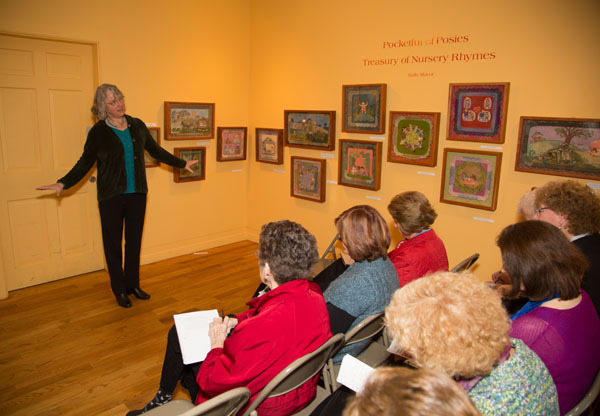 First was the Cape Cod Museum of Art in Dennis, where I spoke to a group of docents about my Pocketful of Posies exhibit, which will be on display through Jan. 26, 2014. In this photo, it looks like I’m about to launch into a tap dance routine, which I wish I could do. I must just be answering a question or emphasizing some point. I gave some background information about my artwork and career, so that they would have some stories to share with visitors. The docents were an enthusiastic audience, with lots of great questions. They even took notes! 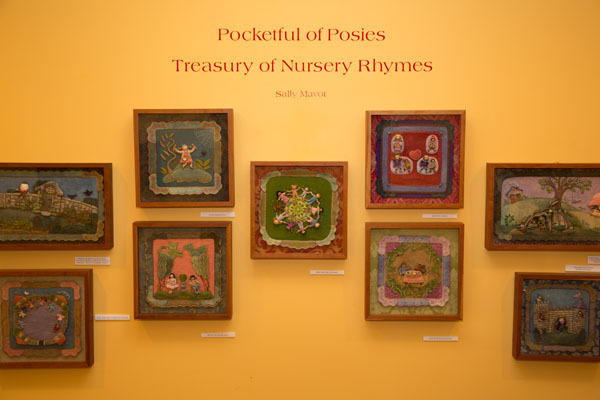 The artwork is hung low, so that all ages can see up close. I can’t get over how perfect the gallery’s golden wall color looks! And I really like how the frames are clustered together in group-lets. My only complaint is with the misspelling of my name on the wall, which they’ve promised to correct! Adding the “e” to Salley is a life time job. 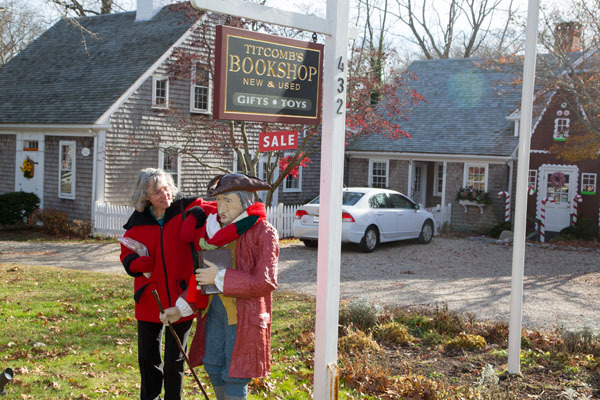 Since we were going to be in the neighborhood, I arranged ahead of time to stop by Titcomb’s Bookstore in Sandwich and sign books. I posed with their Colonially dressed statue out front and noticed our matching coats and hair styles. I should have brought my tricornere hat! 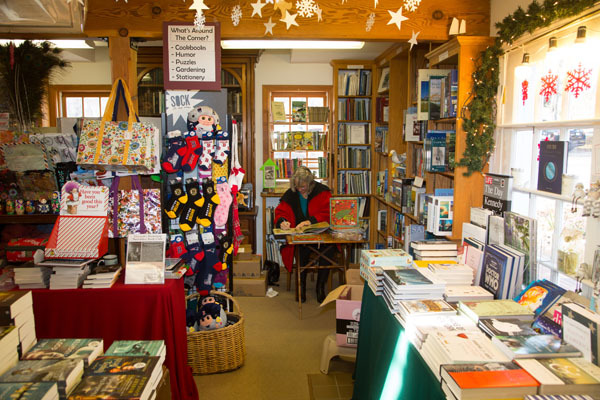 Their store is in an old house crammed with shelves and tables full of books and incidental gifts for sale. I sat down at the old school desk in the corner and signed a stack of books they had waiting for me. The owner, Vicky Titcomb, has been sending customers down to see the exhibit at the museum. I hope that some of you will take a drive down the beautiful Old King’s Highway some time! 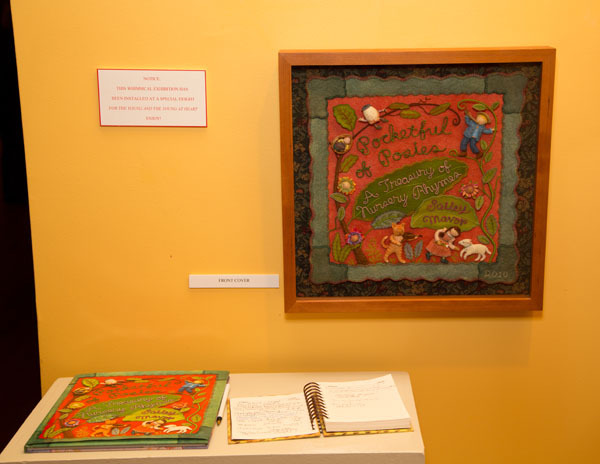 This entry was posted in Children's Books, Exhibits, Fabric Relief, illustration, Posies Traveling Show, Travel by Salley Mavor. Bookmark the permalink. How beautiful Salley. Thanks for letting us see into a part of your world. Thank you for sharing Salley. Wonderful!